Dear Reader: This is featured on our color pages. It was originally written when blogging was more popular than posting. The ombre trend was new, it later peaked around 2015. We spent a lot of time explaining: balayage is a technique ombre is a look- 2 different things. Freehand color like balayage is less structured and now fairly common, but its a service that has a lot of room for error. This post has over has 13,000 internal comments. It’s been viewed over 300k times, and still gets linked. I recently I read through it because I had forgotten about it. My prediction of corrective color becoming the next big color market proved true. Ironically that makes this post even more relative today. This was written 1 year before Instagram debuted. For some time I have felt IG has de-valued our industry. If I were a client seeking color I would think salons probably know color equally. Nope. With balayage, there is a whole new area of color work evolving- SPECIALTY WORK.This technique is unique and in the last 2 years clients have come to our salon seeking color corrections from “master” stylists. That’s not new, but we have had a big spike since the ombre trend. I’ve seen some horrifying color lately. I think the more stylists & salons use “master” to describe their work, the more confused people become. Even in our industry younger stylists are confused. Perhaps some older stylists who’ve never met a master stylist are confused as well. It’s our job to inform you about our industry. But our industry is filled with alot of ego and gimmicks. I’ve realized our industry is going in a direction I dont like. 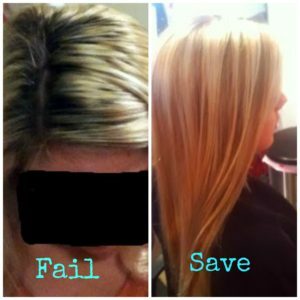 Salons are either failing customers with misinformation, or flat tricking you folks. I’ve been doing balayage for awhile now successfully, I don’t refer to myself as “master colorist”. But if I keep seeing the type of color that comes in here from other salons, that may change soon. will probably change soon. So I search these colorists after clients leave and let’s just say what is advertised online must an inflated perception of ability. Many are starting to use this legit salon term WAY too casually. Plus I’m seeing some whack color from “balayage specialists.” so let’s back up a sec. I always thought master stylists were guys like my famous mentor. Granted I’m older now, I can probably expand that, but still.. I’m baffled. I’m getting new clients from stylists with impressive sounding titles who walk in my salon with terrible color. I think it must be to gain new business from the ombre and the new balayage trend. We’ve been lucky, the bad economy hasn’t affected us but I know lots of salons are hurting from last years stock market crash. Now we have this whole mortgage crisis going on. It’s why ombre started! People couldn’t afford to get highlights so they grew out and since Prada did last years ombre bag collection (which I love) its a legit hair trend. I bet in the next 10 years there will be lots of spin off color services to follow. I’ve seen local “master” work in my chair and had to fix it. I recently learned some stylists read my blogs, thank you! I apologize, this is not meant to offend but I write for clients and they know I keep stuff real! Look below at an example of what I’m talking about. This client received a balayage highlight from a local salon. She called us frantic the next day to fix it. In the last month I’ve had 4 new non referral balayage clients that have been to salons where stylists were “balayage specialists”. First, I’ve made it my business to know who does what in KC salon’s, and who does it well. There’s already a suspicious amount of master stylists here anyways. Since this new era of color there are hundreds now! The last time I went to Loreal Academy was just 4 1/2 years ago in 2005 – there were like maybe TEN in KC. Stylists…c’mon. Me thinks there’s a link to the sudden spike of talent in our area and the bad economy. That doesn’t bode well for the credibility or quality of our local salon industry. But if it’s happening here, I can only imagine it’s happening in areas hit hard by the recession. It must be working because the ladies paid good money for bad color, so it probably won’t stop wither. Ok back to this client. She was told the stylist was a “master”. In this case I don’t think the stylist was necessarily inexperienced with color- just balayage. Based on what I saw on the client’s hair and my personal experience doing balayage, it takes more focus than regular color. Even if you feel you’ve mastered basic salon color, this type of work should be gauged outside that scope. This picture is becoming common in many clients we see. We decided to start taking more pictures of hair. Ombre is hot right now so balayage will get more popular. Styles evolve. Ombre is here because two years ago in the crash of 2008 people couldn’t afford regular get highlights. People like appeal of less maintenance so the grown-out look became an actual thing. Same with balayage. Client’s want more and more out of their color visits now. I’ve noticed new people want a lot of result in one appointment! Why did this start happening? I think it’s social media. Now with this new site Pinterest more clients ask for some difficult colors. I’ve had to assess how I price because some of them are major WORK and I feel confident with color and balayage. people are expecting a lot out of color. In my last meeting with my marketer she trained me to use a hashtag because new social media sites like Instagram use them for search. We are seeing a lot of pictures clients show us from there. Most of them are really edited which concerns me for the future of our industry. With sudden information being part of how we display work, I wonder how accurately stylists describe things. I hate to be a traitor to my trade, but there’s a reason our industry has a stigma. There are a lot of sketchy people in it. I’ve personally heard of stylists watching a YouTube video about balayage, then Um, no. Though helpful, that is not real training. Quality color education is rare and hard to come by, especially in the Midwest. That’s why I went to New York for my color foundation. And my 3 trips cost 10k. A real balayager makes it look simply done, which makes a hairdresser think “I can do that”! By nature, we like try new things! That’s a good thing. But a stylist who hasn’t received advanced hands on training on this service should not be attempting the technique on a client until they are extremely skilled with it. It’s a color that you must do multiple times before offering. Schools may do it in the future, but they don’t now! At all! I’ve heard inexperienced stylists say, “fake it till you make it”. In our salon this common industry thought process is unacceptable, yet also why we fix color. A Studio 39 balayage colorist interns and trains with me directly. They must have a natural ability and talent for free hand color work and that falls way outside of traditional foiling. Not all have it. It’s a skill for an outside the box thinker because it’s conceptual color, not architectural. Like art, conceptual is more loosely defined and requires an artistic approach. Architectural is based on head shape. The type of color taught in beauty school. A stylist also needs to know when to tell a client this service is not for them because if you have dark hair, your highlights won’t get light with balayage. At least not the first time. In 2002 I traveled to New York for the first time to learn advanced color and this method because I loved the Gisele and Jennifer Aniston highlights. I practiced for a year before I felt confident offering it. I made a lot of mannequin heads blotchy! When I finally felt confident, I hardly got a chance to do it because everyone still wanted those chunky thick highlights from 2003, ew. Since then things have changed and I’ve been asked by area salons and beauty supply stores to teach classes on this service. Although I’m flattered, I always decline because I feel it takes more than a seminar to learn this. I was shocked to learn large chain salons are teaching this is in day classes now. These are clearly places not owned by a stylist who works behind the chair. I would never have an inexperienced stylist perform this service on my salon floor. These places might be o.k. to purchase a hair brush or nail file, but if clients don’t know this is not the place to get challenging color techniques like balayage- our future industry is doomed. I know that sounds harsh, but we’ve seen the above scenario dozens of times since search words like ombre and balayage have been flying across cyberspace. It’s bound to get worse. 1. How long has the stylist been doing balayage and where did she/he recieve training? 2. Do they use a special product designed for balayage? Because they should. Number 3 is important. There are several types of balayage- most colorists just don’t know! I do American Balayage which is a technique created by Beth Minardi. That may evolve as well but currently no-one in KC does it. S ask and educate yourself so your hair doesn’t look like the before! Very good site,thank you very much for your time in writing the posts. Wonderful blog and tips! Thanks for sharing. Check out some of my tips when you get a chance!